Ian’s published works are available by clicking the link below each book. The classic story of Robert Blair Mayne, late commanding officer of the first Special Air Service Regiment, and legend in his own lifetime. This, the original biography of Lieutenant Colonel Robert Blair Mayne, DSO (3 Bars), Légion d’Honneur, Croix De Guerre and ‘Colonel Paddy’ to his contemporaries, is a lively account of his life and wartime exploits with the SAS. As an Air-Commando, he became the scourge of the Nazis across North Africa, Italy, France, the Netherlands and Germany, while leading the most daredevil and dangerous regiment in the British Army. Such was his reputation that Hitler ordered that he was to be shot on sight. 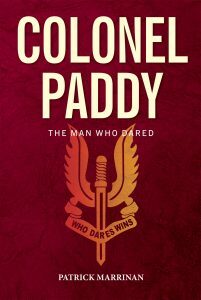 The personification of Irish courage and a man who commanded remarkable loyalty from his men, ‘Colonel Paddy’ remains one of the most decorated soldiers in the history of the British Army. The original biography by Patrick Marrinan now back in print. Few events in the history of Belfast have had such a profound effect upon the memories of its citizens as the blitzing of the city in April and May, 1941. That the city would be a target for the Luftwaffe appears now to have been inevitable, considering the strategic importance of a city with such a long established manufacturing industry. However, at the time the general consensus was that Belfast was out of range of the German planes. This left Belfast, as one commentator put it, ‘the most unprotected major city in the United Kingdom’. There was a heavy toll to pay in human life and material damage. The Civil Defence Services made heroic efforts but were overwhelmed, under-manned and ill-equipped. During the four raids on Belfast almost 1,000 people perished and 2,500 were injured. The material damage saw large parts of North and East Belfast, as well as the city centre, reduced to rubble. The images in this new edition of Bombs on Belfast are those taken by the photographers of the Belfast Telegraph, providing a vivid record and an invaluable archive of the destruction caused to the city and the response of its people. The Cruthin were the earliest inhabitants of both Britain and Ireland to whom a definite name can be given. This book examines their contentious history, from distant origins to their influence on the present day. Their story is a timely reminder of an often ignored common identity. With much original research, this is a compelling and impartial exploration of an ancient people. The fact that so little is known about them is an important and tragic consequence of Irish history itself. On its 40th anniversary, Ian Adamson’s influential book continues to provoke debate. This updated edition shows that the Cruthin controversy remains as relevant and challenging as it ever was. Bangor, once the site of one of the largest Christian schools in Ireland, was the jumping off point for the famous missionary journeys of Columbanus and Gall. The Bangor Antiphonary, which is now in the Ambrosian Library in Milan, was the flowering of a style and depth of worship with unique appeal. In his ‘Light of the World’ Ian Adamson has combined literary skill and scholarship to describe how one of the main strands of European civilisation developed out of the Judeo-Christian tradition of the Middle-East and to bring out the full scope of how Bangor became the focus for religious life of great depth and power in the early medieval period of Europe. “St Columbanus is, of course, the much loved patron saint of bikers around the world; an accolade that reflects his love of travel and great spirit of adventure and discovery. He was a man who looked past the perceived barriers and inevitabilities by which we so often live our lives in order to discover what was beyond those horizons, what was possible, what could be better. In many ways he was a man ahead of his time; a visionary who spoke and dreamt of a united Europe in which we could live and work together in peace. Many centuries after his death he continues to be an inspiring figure who we, in Ireland, are very proud to claim as one of our own.” – Michael D. Higgins, President of Ireland. Among the oldest named population groups of Ireland were the Cruthin, a pre-Celtic speaking people dominant in large parts of ancient Ulster. Their most powerful dynasty were the Dal naAraidi, whose territory became known as Dalaradia, and whose impact upon Ulster’s history and culture is detailed in this book. The Battle of the Boyne in 1690 is one of those events in Irish history which has retained such an emotive potency it still impacts upon the history of today. Yet for all the importance accorded the battle, popular knowledge of the period and the personalities involved remains remarkably superficial, and slogans and stereotypes have substituted for real understanding. This book attempts to remove much of the obscurity by exploring the Battle of the Boyne and its main protagonists in a broader context, especially its european dimension.